The CORE Team always has your back. We work together so that every one of our Clients has each of our Coaches to rely on. We are here to talk to you about your nutrition, your workouts and to give you any health and fitness advice we can. Our Coaches eat, live and breath this lifestyle and are here to inspire you and get to know each of you to make sure you feel comfortable coming to any one of us for answers and advice. Each of our Clients receives a personalized experience where we don’t just bark orders, we educate and focus on the individual, minimizing risk of injury and maximizing results. The personality of CORE Strength & Conditioning Studios is the direct reflection of its head trainer, Michele Scarlet: tough, driven and passionate with a determination to do things differently. After a few months of a desk job post-college, Michele knew this wasn’t the lifestyle she envisioned and was determined to start all over again. Putting her faith in her passion for active living, she quit her desk job to work at a gym and get certified as a personal trainer through the International Sports Sciences Association (ISSA). Michele Scarlet has evolved CORE Studios into one of Toronto’s premiere fitness destinations, encouraging everyone around her to take risks, push past comfort zones and achieve success. Chloe Rhae derives both passion and purpose from working with the everyday exerciser. Especially to those new to the gym, Chloe is a friendly face at CORE who is committed to clients who are ready to work. Boasting a realistic approach to fitness and weight loss, Chloe isn’t one for sugar coating or overpromising; she knows that clean eating and exercise are the way to a better lifestyle, not only a better body. 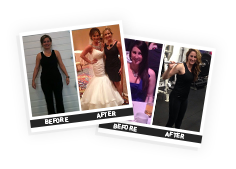 Helping her clients feel comfortable in her own skin, Chloe holds her personal training specialist, fitness instructor specialist, and functional training specialist certifications. The most rewarding part of being a fitness professional for Chloe is seeing her clients present themselves with self-assurance, showing off a ‘sassy’ positive attitude reflecting their newfound confidence inside and out. Riley O’Hearn-Smith grew up overweight and out of shape until he discovered working out. Through being active and losing weight, he felt empowered and committed himself to this lifestyle and sharing the positive impacts of fitness with those around him. A dedicated rugby player and firefighter-in-training, Riley holds certifications through canfitpro (personal trainer) and his certified personal preparation specialist (CPPS). Riley takes the best of all aspects of training, including powerlifting, bodybuilding, and calisthenics to create a rigorous, challenging, effective workout with a focus on safety. He holds a special passion for working with athletes of all disciplines, motivated to see them succeed in their sport.